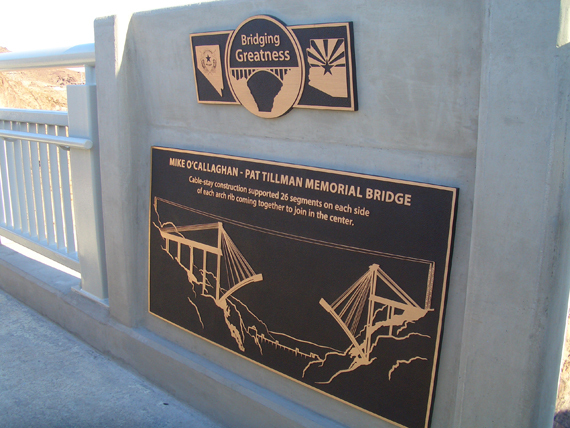 At approximately midnight last night, the Mike O’Callaghan-Pat Tillman Memorial Bridge opened for the first time to ordinary travelers and interstate truckers. 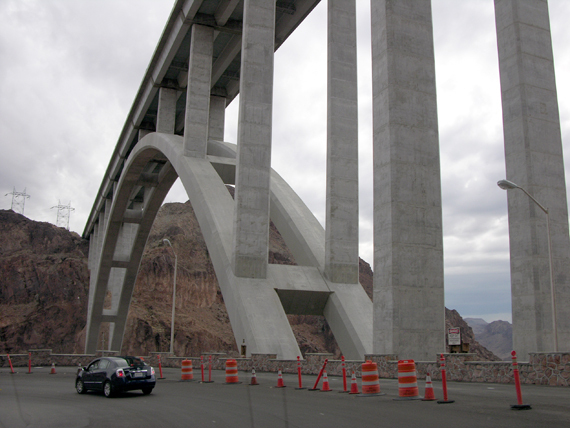 At about noon today, Mark Sedenquist and I drove across the new Hoover Dam Bypass bridge for the first time. 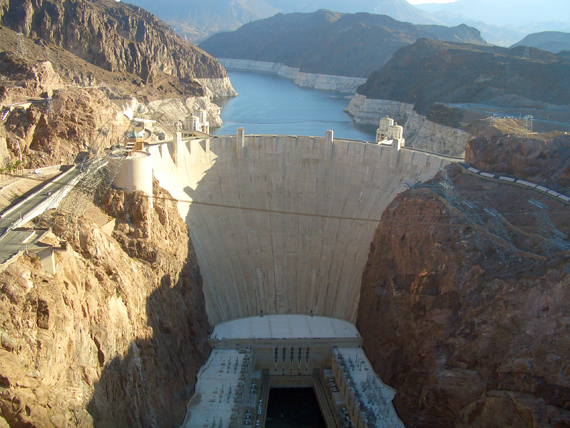 We’ve been publishing updates about the construction progress of this awe-inspiring project since June, 2008. Living-Las-Vegas was also on hand for the opening party on October 16. On Saturday, I was in the first group of “civilian” pedestrians to walk across the bridge. 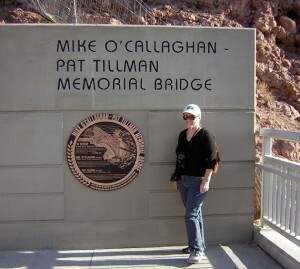 1) It’s easy to cross the Mike O’Callaghan-Pat Tillman Memorial Bridge and never realize you’re even on the bridge. 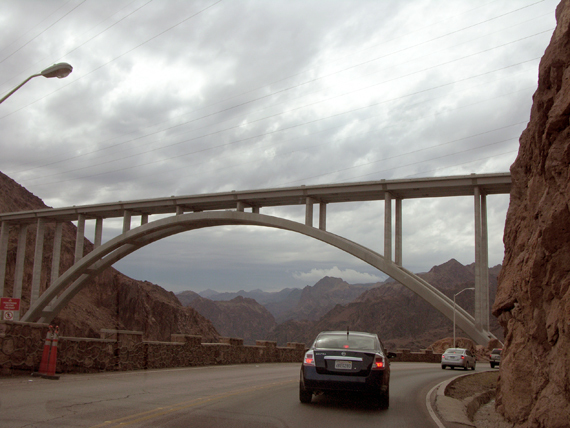 The roadway sits on a concrete span that is nearly 900 feet above the Colorado River, but from the traffic lanes there’s no way to tell. 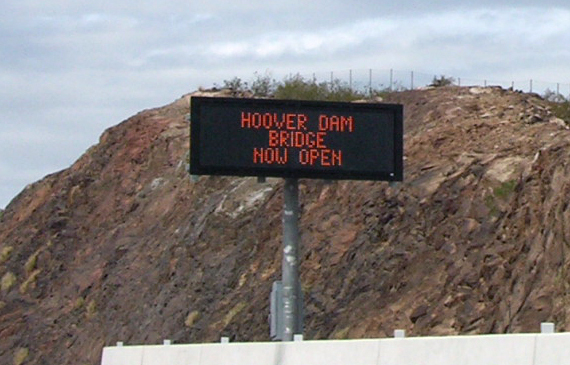 From a car, you can’t see Hoover Dam, the Colorado River, or any indication that you’re even crossing a gorge. All you can see are the top of cliffs, which look like distant hills. 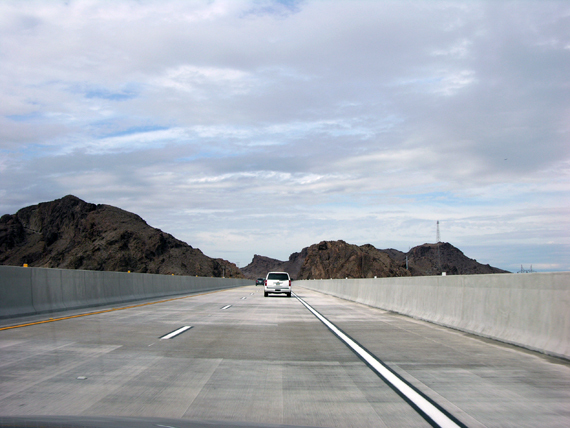 2) The road surface is very smooth and clean. The cleanliness won’t last, but it’s nice right now! 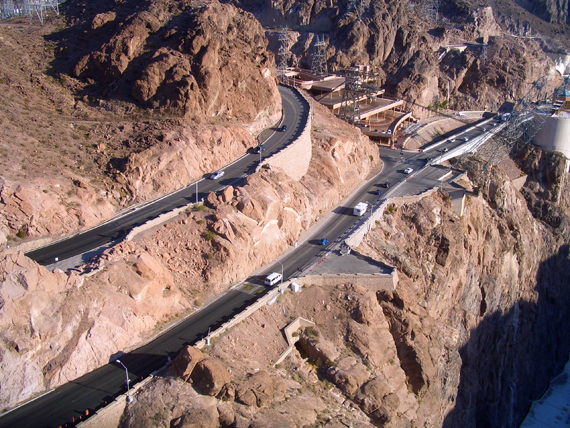 3) Crossing the bridge, turning around, and returning to the Hoover Dam exit ramp (exit #2) was smooth and easy. 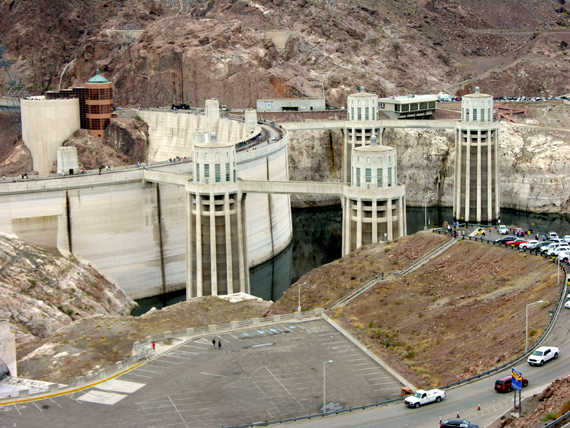 There were hundreds of visitors at the dam, but no traffic jams! 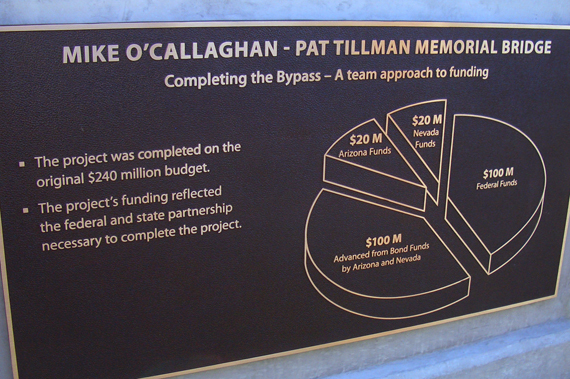 I think this is a very nice improvement for tourists. 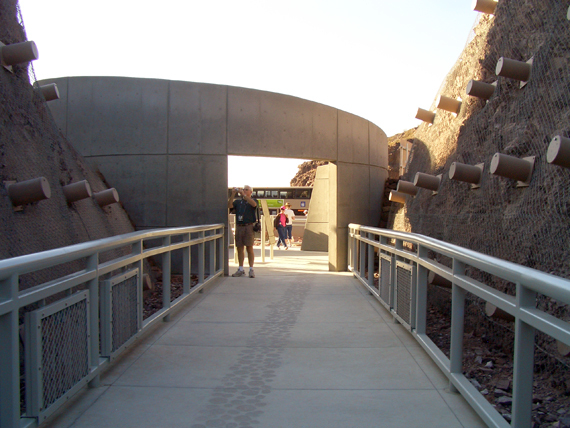 5) There’s a nice new parking lot and visitors center just for the bridge. 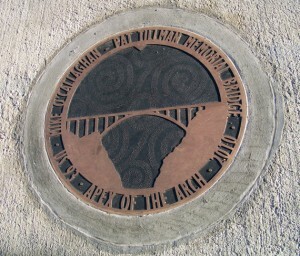 A picture is among those below. 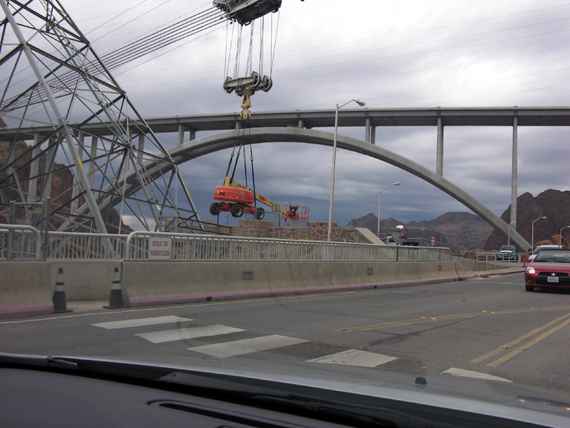 It’s great that the bridge does allow pedestrian access, because the view of the dam is a damn fine view. 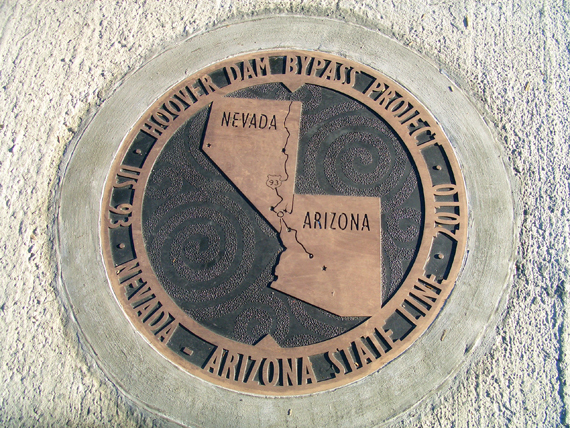 This bronze plaque marks the Arizona - Nevada state line. Another one nearby marks the apex of the bridge's arch. 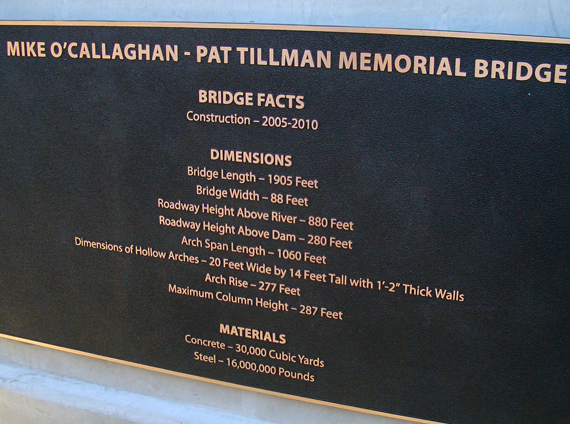 Bridge facts - pretty impressive! 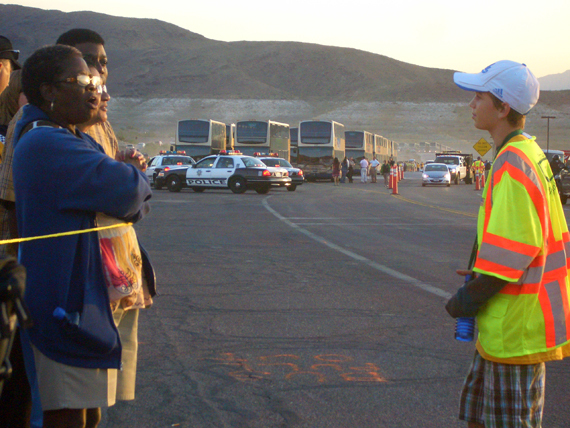 If you scroll up and look at the photo of the visitors waiting for the shuttle buses on the 16th, you can see the high water mark on the hills behind the buses. If the lake was full, where those people are standing, and the buses would all have been underwater! 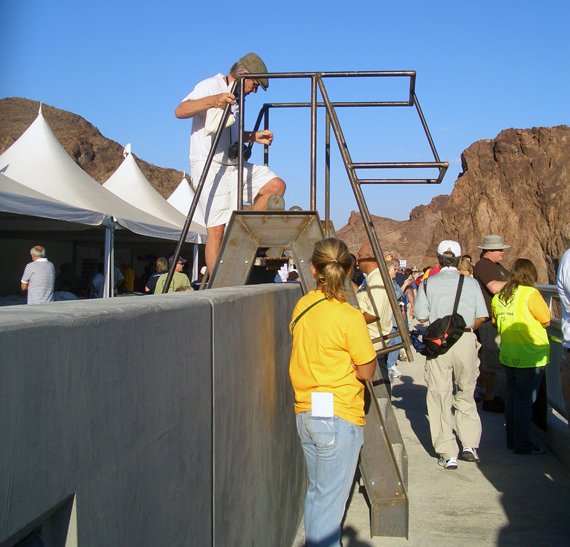 There were 50 double-decker buses staged to shuttle visitors to the Bridge Opening Party! Great photos — love them large. Much better views than a newspaper can give.